So far, a foggy cloud of hot gas has prevented us from making sharp images of the supermassive black hole Sgr A* and causing doubt on its true nature. Astronomers have now included for the first time the powerful ALMA telescope in northern Chile into a global network of radio telescopes to peer through this fog, but the source keeps surprising them: its emission region is so small that the source may actually have to point directly at us. Observing at a frequency of 86 GHz with the technique of Very Long Baseline Interferometry (VLBI), which combines many telescopes to form a virtual telescope the size of the Earth, the team succeeded in mapping out the exact properties of the light scattering blocking our view of Sgr A*. The removal of most of the scattering effects has produced a first image of the surroundings of the black hole. Supermassive black holes are common in the centers of galaxies and may generate the most energetic phenomena in the known universe. It is believed that, around these black holes, matter falls in a rotating disk and part of this matter is expelled in opposite directions along two narrow beams, called jets, at speeds close to the speed of light, which typically produces a lot of radio light. Whether the radio emission we see from Sgr A* comes from the infalling gas or the outflowing jet is a matter of intense debate. Sgr A* is the nearest supermassive black hole and ‘weighs’ about 4 million solar masses. Its apparentsize on the sky is less than a 100 millionth degree, which corresponds to the size of a tennis ball on the moon as seen from the Earth. To measure this, the technique of VLBI is required. The resolution achieved with VLBI is further increased by the observation frequency. The highest frequency to date to use VLBI is 230 GHz. “The first observations of Sgr A* at 86 GHz date from 26 years ago, with only a handful of telescopes. Over the years, the quality of the data has improved steadily as more telescopes join,” says J. Anton Zensus, director of the Max Planck Institute for Radio Astronomy. “Sgr A* is located in the southern sky, thus the participation of ALMA is important not only because of its sensitivity but also because of its location in the southern hemisphere,” says Ciriaco Goddi, from the European ALMA Regional Center node in the Netherlands (ALLEGRO, Leiden Observatory). 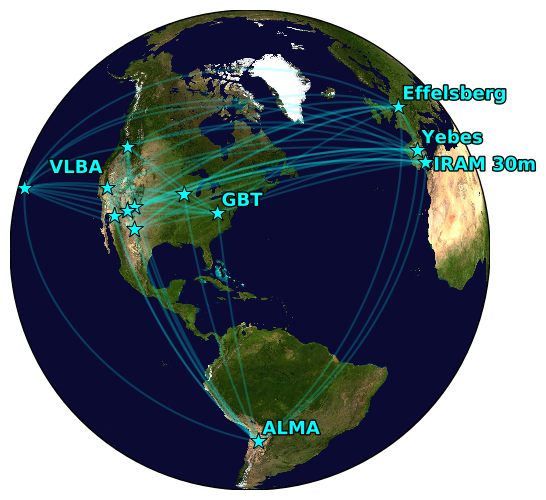 In addition to ALMA, twelve telescopes in North America and Europe also participated in the network. The resolution achieved was twice as large as in previous observations at this frequency and produced the first image of Sgr A* that iscompletely free of interstellar scattering (an effect caused by density irregularities in the ionized material along the line of sight between Sgr A* and the Earth). The Size, Shape, and Scattering of Sagittarius A * at 86 GHz: First VLBI with ALMA: Issaoun, M. D. Johnson, L. Blackburn, C. D. Brinkerink, M. Mościbrodzka, A. Chael, C. Goddi, I. Martí-Vidal, J. Wagner, S. S. Doeleman, H. Falcke, T. P. Krichbaum, K. Akiyama, U. Bach, K. L. Bouman, G. C. Bower, A. Broderick, I. Cho, G. Crew, J. Dexter, V. Fish, R. Gold, J. L. Gómez, K. Hada, A. Hernández-Gómez, M. Janßen M. Kino, M. Kramer, L. Loinard, R.-S. Lu, S. Markoff, D. P. Marrone, L. D. Matthews, J. M. Moran, C. Müller, F. Roelofs, E. Ros, H. Rottmann, S. Sanchez, R. P. J. Tilanus, P. de Vicente, M. Wielgus, J. A. Zensus and G.-Y. Zhao. Article reference: Issaoun, S., et al. 2019, ApJ, 871, 30 (https://doi.org/10.3847/1538-4357/aaf732). Astronomers from the BlackHoleCam team led and worked on the research. The data were correlated at the Max Planck Institute for Radioastronomy (MPIfR). Data analysis software was developed at the MIT Haystack Observatory and the Smithsonian Astrophysical Observatory. 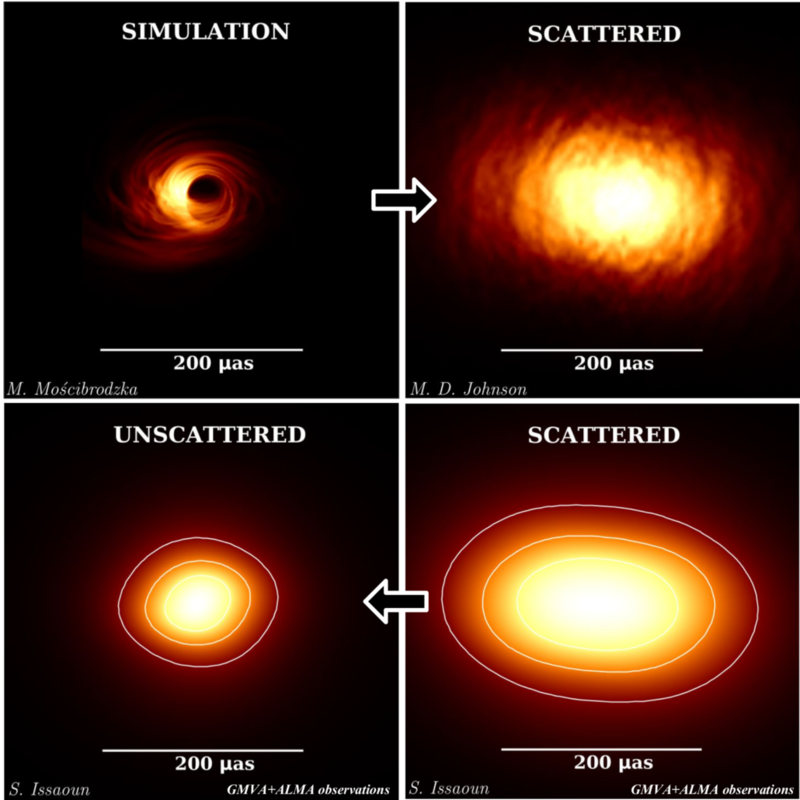 This work is supported by the ERC Synergy Grant “BlackHoleCam: Imaging the Event Horizon of Black Holes”, Grant 610058. The National Science Foundation (AST-1126433, AST-1614868, AST-1716536) and the Gordon and Betty Moore Foundation (GBMF-5278) have provided financial support for this work. This work was supported in part by the Black Hole Initiative at Harvard University, which is supported by a grant from the John Templeton Foundation. The GMVA is partially supported by the European Union’s Horizon 2020 research and innovation programme under grant agreement No 730562 (RadioNet).